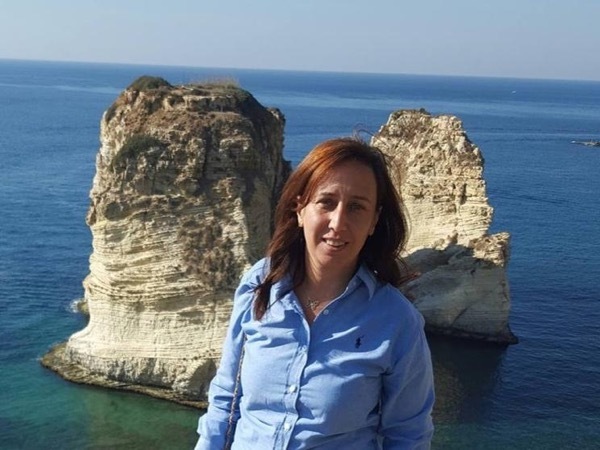 About Mayada M. Message Mayada M.
TOUR GUIDE RESPONSE: Thank you Bettina and wish you will enjoy your stay in Lebanon. Excellent guide, flexible and knowing not only the nice Beirut city, but also languages. TOUR GUIDE RESPONSE: thank you,it was my honor to be your guide. It was a very interesting tour. We drove trough many regions which are loaded with past and recent history. The highlight was the ruins of Baalbek which is really outstanding and a must see. We loved the Beiteddine Tour very much. The palace is so beautiful and peaceful. And a highlight visiting the Chouf district. Mayada was very competent and provided us with all the interesting details. The city tour was a very good start to get a feel for the buzzling city of Beirut. And Mayada thorough introducting to the National Museum prepared us well to the other historical tours.The National Museum is a must see. Mayada is extremely knowledgeable and friendly. 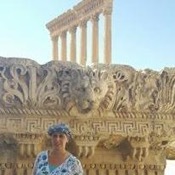 She provided tours around Beirut and to Bybylos and Baalbek. In all these places Mayada ensured that we got the best possible experience and was very flexible. I would thoroughly recommend her to anyone. TOUR GUIDE RESPONSE: Thank you very much .it was my pleasure to show you my country . We both loved our time in Byblos, specially we had with us Mayada who has gone out of her way to tell us many interesting facts and help us see as much as possible in her beautiful country. TOUR GUIDE RESPONSE: Thank you Milicia.i enjoyed my time with you too.wish to see you again. Excellent very knowleadgable and pleasant guide, Mayada made my day enjoyable and interesting. TOUR GUIDE RESPONSE: Thank you .most important that you enjoyed your tour. What an incredible guided tour! Our guide is so knowledgeable. The sites were incredible. I would highly recommend this to all. A must see! TOUR GUIDE RESPONSE: Thank you Gerald . Enjoyed our tour a lot. Got to see the architecture that makes up Beirut. Got to see many different sites. The Beirut Museum was incredible. The guides knowledge was so helpful on the history of Lebanon. We would highly recommend this guide. I especially appreciated how Mayada handled the tour-- I could ask her any question about Lebanon. Lebanon is a complicated, layered country with a mix of fascinating groups of people and religious influences. This small nation has suffered terribly over the years due to civil war, unwanted foreign influence and political division. I felt safe traveling with Mayada. I will use her again as a guide. She understands the people of Lebanon and gave me clear answers to my many questions. Thanks Mayada! TOUR GUIDE RESPONSE: Dear Mr.Steven .thank you and you are welcome anytime to Lebanon.wish to see you again. TOUR GUIDE RESPONSE: Thank you Diana,i m happy that you enjoyed your day.wish to see you again in another tour. Very interesting tour of Beirut and its history. Mayada is very knowledgeable and energetic, and in just over three hours we managed to see a few places, even with having to manoeuvre Beirut traffic. Highly recommended to get the basics on this interesting city. Mayada was an excellent tour guide for a day trip to Byblos, Harissa, and Jeita! My mom and her friend had a wonderful time and loved how thoughtful and informative Mayada was. She was punctual on pick-up and drop-off. We would highly recommend her to others! Mayada is an excellent guide, responsible, knowledgeable, kind and friendly. She adjusted the tour on our personalised needs, and she showed us around places we would never have discovered without her. Our tour wouldn't be the same without Mayada! thank you for everything! TOUR GUIDE RESPONSE: Dear Isavella, Thank you for your review,it was my pleasure to show you treasure of my country.wish to see you again. It's been a wonderful afternoon spent with Mayada in Beirut. She knows so much about the city, its past and present and makes you want stay or come back for more... I will definitely! Hugely recommended! Mayada quickly adapted to the specific needs of our unique project, and she made it possible for us to be highly successful in Beirut. Her knowledge of the city and its people made it possible for her to select the most appropriate locations for our work, and she was highly effective in dealing with the people who participated in our project. She was tireless and dedicated and highly professional, and we enjoyed working with her. Mayada is higly recommended as an insider in Beirut. TOUR GUIDE RESPONSE: Dear Brian, Thank you and i enjoyed that you achieved your work.wish to see you again in lebanon. After a somewhat conventional beginning, Mayada adapted her tour to our expectations. She is a very nice person and made a lot of efforts for us. We spent a very pleasant day with her in Tripoli and Byblos. (Customized tour). TOUR GUIDE RESPONSE: Thank you and i wish you had a great time. Mayada offered the tour in French and we had a great time. Highly recommended.